September 11, 2014, Austin, Texas—Natural Vitality is thrilled to announce that Natural Calm has been awarded the PTPA™ Winner’s Seal of Approval. From a consumer perspective Parent Tested Parent Approved is the gold standard of quality assurance. 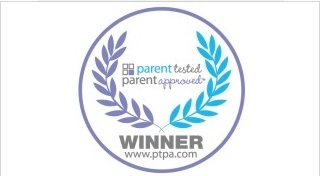 Parents know that when they see the PTPA™ Seal of Approval they can feel confident that their dollars are well spent and that their families will be happy with the purchase. Natural Calm was among many entries across North America competing to earn the PTPA™ Seal. Independent parent volunteers evaluate these products in their homes to ensure that winners are chosen based on merit and actual consumer experience rather than commercial consideration. The first night I tried this product, I already felt it working. My body no longer felt tense and I slept the best I had in weeks. I did not wake in the night as I usually do with a list of what needs to be done the next day and instead just felt at ease. This in turn helped me to concentrate better at work! I enjoyed that the drink was slightly fizzy and the flavor was good without being too overwhelming. Plus, with it being gluten-free, vegan and certified [Non-]GMO, I did not feel uncomfortable ingesting any of the ingredients. With the individual packets, it is very convenient and easy to travel with. Visit www.PTPA.com for more information.